The CPD Leads Package includes a session plan and accompanying materials based on the input provided for the regional advisers supporting The Education and Training Foundation’s blended learning Practitioner-led Action Research Programme 2014, developed and delivered by emCETT. The materials have been re-purposed for CPD leads supporting action research within their own organisations. CPD leads to have a clear understanding of the underpinning theory to the programme and their role within the delivery of the programme. 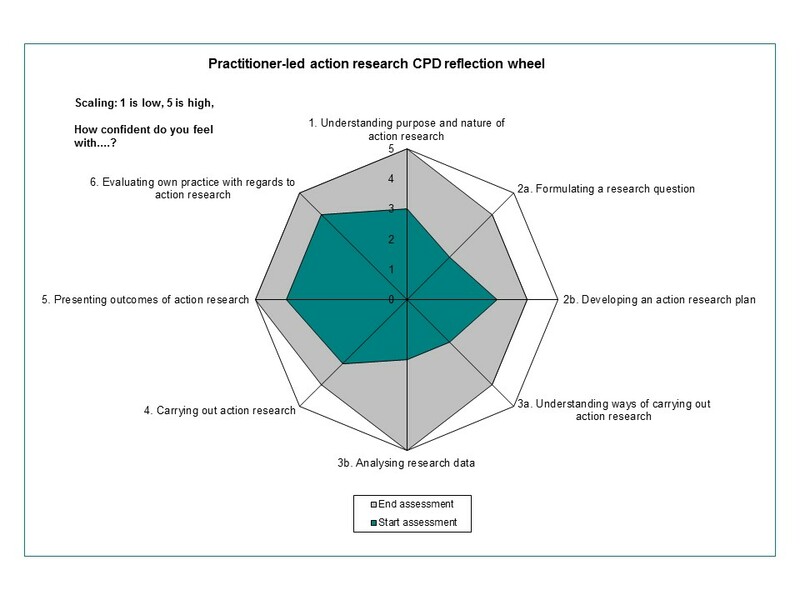 Pre-reading for the participants in the programme (and CPD leads) was An Introduction to Practitioner-led Action Research – a ‘how to’ guide for practitioners and managers which includes the action research cycle (reproduced with permission of Education Scotland). Regional advisers encouraged participants to undertake a self-assessment of their action research skills, knowledge and understanding at the start and end of the programme using R4. On average participants moved up the scale by 1.6 steps (32%). Here is an example from one of the participants showing an improvement on average of 1.6 steps.